A mother, who engaged in an employment ambitiously to bring prosperity to her family ultimately destined to arrive in the country in a coffin, after being a target of gunshot of a mentally retarded Saudi Arabian national. She was Priyanka of Katumburawa, Wanduramba, Galle. She married Upul, 22 years ago and they became loving parents of three daughters. When died, Priyanka Jayasekera was 38, while her husband Lelwala Guruge Upul is 48. Their elder daughter Chamila Asiri (21) is now married and a mother. Her second daughter Amitha Keshani (12) a grade eight student at the Urala Vidyalaya and youngest, Nethmi Pamodya (08) is in Grade three of the same school. As the children were growing, the young couple thought of a good future for their children- to educate them well and build a house. About nine years ago, Priyanka was offered to go for employment abroad with the blessing of her husband, with the hope to usher in a better future for the children. The other end repeated the same demand. "On May 12th Upul’s phone rang. 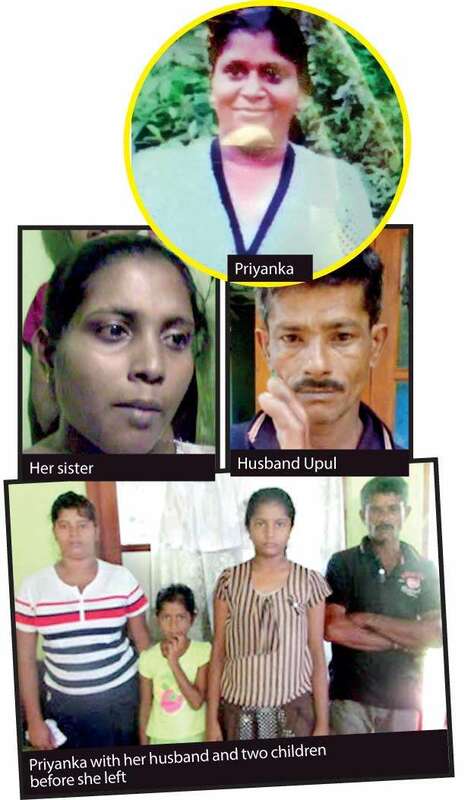 Knowing it was a foreign number, he anxiously began to speak to his wife but from the other end he was told it was not Priyanka…"
“Madam might have withdrawn the complaint by now,” Upul replied. There are doubts about the official version on the death of Priyanka. However, the Saudi Police reported that Priyanka’s death had been caused by a gunshot fired by a mentally unstable man. According to a statement of the Saudi Embassy Priyanka had died after being shot by the mentally retarded 31-year-son of the household. Her body was brought to the Al Ras Hospital in Saudi Arabia. The gunman also had shot himself. Whether the suspect is actually mentally retarded or not, can one believe the official version of that country? These doubts linger over her death. Whatever the cause of death, it is a loss of a kind mother of three daughters and an affectionate wife to a husband. “My wife’s death left us helpless. I earn for the sustenance of our family with hard labour. What she earned working in a foreign country, is some relief for our family. 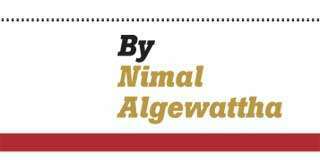 But now she had left us in misery,” Upul said. Priyanka’s body has not been sent yet. It is likely to come after few months. Upul said that he had appealed to the Ministers and officials to intervene and take actions to punish the murderer and to compel relevant officials for compensation for the children. The Sri Lanka Foreign Employment Bureau (SLFEB) said that procedures related to foreign employment services had been now improved to a satisfactory level. But still, thousands of Sri Lankans are subject to harassment and abuse at the hands of their employers in the Middle East. Priyanka of Wanduramba seems to be another victim of such abuse.